Okay, so I did it. I completed my experiment and went 365 days without watching any live sports on TV or in-person. Honestly part of me is sad that this experiment is over because I learned so much during the experience. And I didn’t think it would take me this long to reflect and gather all my thoughts, but I guess this just goes to show how much impact live sports has on my life. Writing this post has made me I realize that I’ve only just begun to understand the level of impact that this experiment and watching live sports has had and will continue to have, on my life. It was an extremely fun and revealing experiment that I always wanted to do. And I’m glad that I picked 2014 to do it and not 2015. If I did this experiment this year I think I would have possibly lost my mind not being able to watch the Cubs. I will say not watching sports in 2014 made the Cubs season and playoff run even more sweet to watch. Like all good experiments, I started this experiment inspired by my curiosity, a few assumptions and lots of questions. And like most experiments I found truth but uncovered many more questions. So here are a few things I learned as I reflect back on the experience. This isn’t by any means the end of my reflection but it’s the first steps forward as I start to unpack the meaning and significance of this crazy adventure. This post is also an exercise in Working Out Loud so I hope you enjoy it from a WOL perspective too. 1. I love watching sports to connect, feel emotions and build relationships. 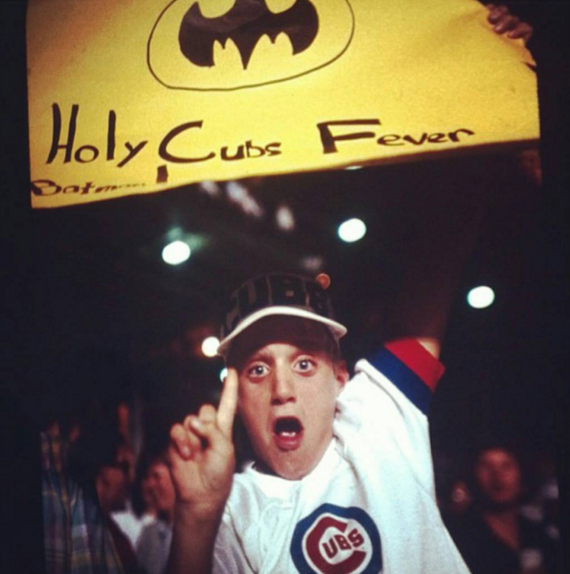 As you can see by that picture above, I’ve always been a sports fan, especially a Cubs fan. And this experiment has helped me begin to understand all the emotions surging through the heart and mind of that 12 year old kid. This experiment has helped me understand why I do get so pumped and excited, and how that crazy love for live sports has grown and influenced me throughout the years. I’m not the kind of sports fan who watches every game of every team. But I’m a guy who enjoys watching and playing all types of sports for many reasons. And honestly, I didn’t realize how much I actually did enjoy watching live sports until I took it away for an entire year. I definitely noticed the void in my my life and felt the impact on the relationships around me. And for that reason, this experiment was a struggle and revelation and a bit frightening on my levels. I had the chance to reflect on why I get caught up in the game of live sports. Why I do yell, scream and even cry during games? Though I’m an introvert in many ways, I love being around people, especially at sports games. I do watch sports on TV alone often but I have many fond moments of being submerged in the glory and roar of the crowd at Cubs and Bears game. I also realized that I love being a part of the long text messages that erupt during games as my family shares their excitement as the game unfolds. Because I’m wired up that way to love being with people, this experiment did put a strain on my relationships. During 2014 not watching sports presented me with moments where I had to physically remove myself from a family event or talk with people while they watched and I didn’t. My brothers, to my surprise, actually supported my experiment by not watching a Blackhawks game during a family party because they didn’t want me to stumble or break “my vow” as they called it. And because I wasn’t “allowed” to watch sports for an entire year I had the chance to have some great conversations that I otherwise wouldn’t have had. I struggle to reflect on this aspect of my experiment because I was confronted with the hard truth that I often don’t fully engage with people when sports are playing around me. Why is that? I’m not completely sure. This bothered me. And as a result a whole bunch of questions came bubbling up. Why do I look past people to catch a quick glimpse of the big game flickering on the TV when I’m suppose to be paying attention to the person in front of me? Why do find it more enjoyable at times to watch a game then engage in conversation? What does this say about me as a person and us as sports fans? Why do I watch sports to escape from human and social interaction? Am I missing out on deeper relationships because of my desire to escape from the moment in to live sports? Do I have a live sports addiction? These questions scared me but I had to dive in and face them to figure things out. Part of why I did this experiment was to answer those questions and figure out how not watching live sports would impact the relationships with men and others in my life. In short, sometimes not watching sports did and other times it did not. I learned that I have friends and relationships where live sports doesn’t impact how we interact or what we talk about. Sports didn’t even come up once in those conversations and we can talk about other things. But when interacting with guys at work, or with guys I just met, it’s basically impossible to avoid talking about sports. So what did I do in these situations? Well, I either had to tell them I didn’t watch the game and tell them why, which led to many interesting conversations about my no live sports experiment. Or I faked it. Yes, I faked it. I created a sub-experiment during which I faked like I did watch a live game. This led to some interesting moments where I relied on my past sports knowledge and love for fiction, improvisation, imagination and making things up to have a little fun. So sometimes I made up fake highlights and plays that never happened and inserted them into conversations to see what would happen. This was interesting because several times no one challenged me or questioned my fake highlight. In most cases they simply said “Yeah, that was an awesome play!” Other times, I did get some strange looks but they didn’t challenge me or ask me about the reason for sharing a fake highlight. As bizarre as all of this was, those moments made me really think about how we interact as humans in work and surface and small-talk type situations. My experiment was also tough because I had to opt out of several group sport watching events. At work I avoided an event where our VP of communications invited us all to watch the US hockey team take on Canada. I didn’t go to the event and instead, as hard as it was, I resisted the social pressure and internal urge to watch the game with my fellow co-workers. Again, I paid close attention to how I felt. I felt disconnected, anxious and nervous. Why? I wondered if this one event would have any impact socially at work? These type of events tend to be good times to take a break and get to know co-workers and I was not there. Would my act have a negative impact on team chemistry? Would I miss out on jokes and moments that others would share? Maybe. Did it impact my career path because I didn’t have a social or networking-type interaction. Maybe. But it’s hard to tell at this point. I also opted out of watching the 2014 Super Bowl and instead watched the shows on the History channel. Since the Super Bowl Half time show isn’t technically live sports, and I’ve always loved unpacking the meaning of live music during the Super Bowl, I watched Bruno Mars put on a great show. Though she loves to play many sports, I learned that my wife only really loves to watch the Bears and Sox, and she doesn’t care about other sports as much. So when those two teams were on I had to come up with creative ways not to watch, like sitting facing the opposite way of the TV or going to a different part of the house to play with the kids. Again, hard to do and it showed how much I love using live sports to connect and share those moments with those I love. There was something about those moments with my wife that drove my curiosity and I wanted to understand more about what live sports does to family relationships? What is it about sharing live sports moments with family that makes it different than strangers? Why do we use live sports to mark important family moments? Why does the big game give family a reason to get together? 2. Watching live sports can become an addiction, but am I addicted? According to wikipedia, addiction is a state characterized by compulsive engagement in rewarding stimuli, despite adverse consequences. In other words an addiction is something we keep or can’t stop doing even though it can cause us or other around us harm. I thought about that, and other definitions of addictions, throughout my experiment as continued to wonder…am I addicted to live sports? I learned that watching live sports can be a slippery slope, a dangerous neurological and behavioral experience for me. I feel that each time I watch a game I dance with the temptation of over watching and getting to emotionally attached to what’s happening or becoming a slack-jawed-zoned-out sports zombie that can’t stop watching. ‘Why do I do this? Why do I get like this?’ I wondered. Yes, I know we can become mindless slaves and hopelessly addicted to many things in life but I learned that with sports, it’s especially dangerous for me because I can be fooled into thinking that I’m dealing with emotions that I’m not really dealing with. Or I can use sports to avoid things I must do, feel, face and accomplish. Though it’s okay to zone out once in awhile, I found that I often go beyond the healthy limit of using live sports to just zone out. I found that I often use live sports to avoid things I must do. I discovered that I use live sports to avoid feeling emotions I must feel. I found that live sports is like a strange nostalgic drug. But what was beautiful about this insight and asking these questions was that I found that when I watch live sports to avoid, I often get ambushed by emotions I didn’t expect feel or emotions and memory I was trying to avoid. This emotional ambush might come up when a memory is jogged by a well-designed commercial or a play that triggers a happy or sad moment with my dad buried deep in my mind and soul. In those moments, I fought to feel the emotion but then found myself stuffing it back down. Why was I fighting feeling this emotion? Why was something as simple as a live game bringing these emotions back up? Why not just let the emotion have it’s way with me? Wouldn’t that make the live game experience better? It wasn’t that easy. So, as I basked in the glory of the Cubs 2015 season and their inspiring playoff run, I couldn’t help but wonder ‘what’s making me so crazy?’ Why was I struggling with feeling the emotions? I could embrace the good feelings of hanging out with family and friends but when Go Cubs Go strarted playing I got all watery eyed and fought to truly feel the emotion? What was it? Sadness? Fear? Joy? I wanted to feel the moment and all the joy that comes with watching Kyle Schwarber launch a home run bomb over the right field wall in Wrigley. In retrospect I thought about how I missed my dad when watching Cubs games. 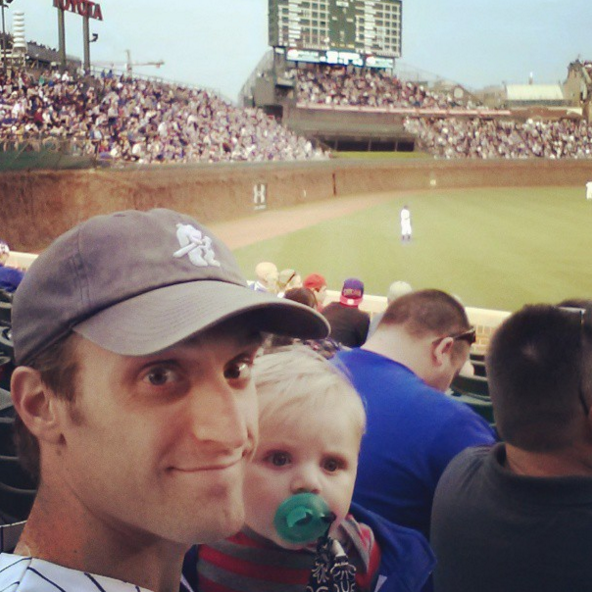 I often though of him during 2015 as I watched sports again and I looked at my son and wondered if him and I will have the same connection with the Cubs and baseball. Yes, I thought a lot about my dad during the experiment (more than I expected) because that’s where a lot of the emotional significance of my live sport moments come from. I knew that going into the experiment but it became much more real to me And because I wasn’t actually watching sports I had the time to reflect on the relational significance that sports had the relationship with my dad. And now that I’m back watching live sports with my own son those fatherly memories I’m creating with him are all the more special. I’m more aware of how special those moments were for me and I found myself cherishing them more as they unfolded with my son during 2015. And because of this experiment those moments with my son, like his first Cubs game at Wrigley in 2013, all the more real and palpable. Because of this experiment I’ve found myself no longer able to stuff the emotions down but I’m getting more comfortable actually feeling my emotions during a game. I’m not perfect at it but I’m getting better at letting the joy or sadness or whatever ever emotion have it’s way. As uncomfortable as it might be for me when it happens, I’ve found a deeper sense of joy and pleasure in embracing the moment for what it is and letting the emotions come up and have their way with me when I find myself getting unexpectedly emotionally ambushed during a game. And the beautiful thing is that I’ve even experienced a moment where my son, even at three years old, looked over at me during a Cubs playoff game and asked if I was okay because my eyes were wet and cloudy. So I told him why and he just looked at me as I tried to explain it in a way he could understand. I’m not sure I did a good job explaining things but maybe he’ll read this post when he gets older and things will make more sense. So I think this is why live sports has such a strong hold on me. Watching sports has a strong family connection and deep emotional history. There’s a lot going on emotionally under the surface in my heart and mind during a game. On one hand, subconsciously, I’m using live sports to relive nostalgic moments and good memories. Then, on the other hand, I’ve been conditioned by media and culture to love the flashy and fantastic highlight-reel moments that live sports give us during a game. It’s a complex back-and-forth inner battle that I’m much more aware of and this new found awareness has added a new level of enjoyment when I watch live sports. But this still brought up an important question. Where is the line between just enjoying the moment and finding simple pleasure in watching a game and it being an addiction? Where is the line between having a good time watching a game and over indulging and living in the past? Is this what causes sports fans to take a simple love for sports and have it turned dark and morph into a live sports addiction? And how do we know if it’s a live sports addiction? Do we use the amount of time wasted and emotions avoided and relationship damaged to measure our addiction? Do we use those signs as a signal to let us know when things are getting dangerous? Through this experiment I’ve come to realize that my brain has a hard time finding and then not going over the line. I’ve realized that’s partly why I get sucked into watching highlight shows when I’ve already watched the game. Too often my brain doesn’t know the difference between the live version and the memory bank version. Because of this, I think my brain, on a basic and primal level, loves what it feels like to watch a present moment because it thinks it’s reliving a past moment. Of course it doesn’t help that basically half of watching a live game on TV is watching the instant replay over and over again, which reinforces and feeds the hunger my brain craves. It’s a nasty neurological and behavioral cycle that’s tough to break. So this powerful neurological cycle keeps going round and round. I watch a game and I find pleasure in those live moments as my brain and memory associates the present with all those wonderful moments and memories I have with my dad and growing up. I also realized another truth. At a basic level, we as sports fans who are human beings, just love to watch something spectacular happen because it simply put; it’s an escape. Live sports take us away from the mundane moments and by watching live sports we seek out that rush of pleasure. And that’s what we can get addicted to. This process is so complex that it’s taken me nearly a year to sort it out and begin to make sense of it. And I’m not even sure I explained clearly enough to you here. But I’m glad I took a year to not watch sport to begin to figure it out. And I’m sure this is only the beginning of what I’ll learned and more will be revealed to me in the coming years. Like all good experiment should do, the more my experiment went on the more I realized how little I know about myself and why I love watching sports. But what I do know is that like with most things in life, it’s about balance and moderation. So that’s what I’m striving for and trying to be more aware of. I found that I do love that rewarding rush of stimuli that live sports gives me. But was I indulging in live sports regardless of adverse consequences? Was there a deeper physiological battle waging inside of me? Yes, there was. 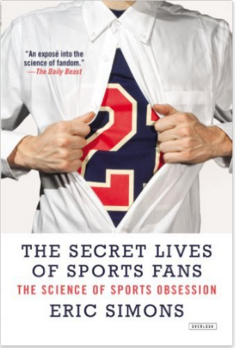 Through this experiment I became more aware of and fascinated by the physiological, sociological and psychological impact of watching live sports and I loved reading The Secret Lives Of Sports Fans to guide and explain some of my curiosities. In this book I learned more about the reactions we feel during live sports. I learned that what we feel by watching our favorite teams by ourselves or with friends is actually hard-wired in humans to help us feel good. That feeling, though often an elusive mystery, is designed to keep us in the moment individually and designed to connect and bond us with other people on a deeper sociological level. As I read that book I learned, and became more aware of, the danger of over-escaping and getting addicted to that feeling of excitement and rush of adrenaline. That powerful chemical reaction that happens after a watching a walk-off home run or triumphant touchdown can be so seductive and trick me into thinking that by watching sports I’m some how dealing with my life and facing my fears and connecting with others when I’m really not. This sociological, neurological, physiological and psychological aspect of my experiment was by far the most complex and I’m still sorting it all out. I’ll likely write more about this as things become clearer and more is revealed to me. But what I do know now is that by not watching sports for a year I had the time and opportunity to stop and reflect on what is actually going on in my body and mind during a live game. For a year, I wasn’t just a mindless sports zombie lost in the constant loop of the highlight reel. For 365 days I was able to scape the seduction of the highlight reel just long enough to understand the meaning of why I love to watch live sports. Now the challenge is to build on this knowledge and figure out how to put it good use. 3. I love learning from the strategy of live sports. I’ve always enjoyed learning about the story beyond the game itself and I love learning from the strategic elements of live games and apply what I learn to my life. I believe this is one major reason why I missed watching sports in 2014. In addition to connecting with others, I initially thought that I just escaped into a game to avoid life but this wasn’t the case. I love the “game within the game” of sports. Many say that baseball is too slow of a game, but not me. I love the mini games of chess going on within baseball, and I missed that a lot. And as I watched Joe Maddon lead the Cubs in 2015 I was excited to watch the post-game interviews because he isn’t like other managers. He’s like a wise sage and always says something that teaches and puts a new, fresh and uniquely personal perspective on baseball and life. Not watching for a full year and then watching the Cubs and other live sports this year, I realized that a subconscious part of my brain is watching for those strategic moments that I can apply to other areas of my life. Those moments when a coach or a player has to make split decisions or show leadership in a critical turning point in a game. I love it when these strategic and teachable moments come along in live sports because I’m not just shutting my brain off and going on auto-pilot but instead there’s an exciting opportunity to engage and extract more meaning. There’s a beautiful micro-moment where I get challenged to think in a new way or a simple play becomes a major turning point in a game and a players career and even a fan’s life. Okay, now for my take on the part about live sports that bothers me. By not watching sports for a year I realized how much I don’t like the cliche tendencies of highlight shows and play-by-play announcers. Yes, there are good announcers that know how to put fresh spins on live sports and tell a great story and deftly present the broader context and significance to the live game. But far too many in the sports world fall victim to cliche story lines and predictable post-game questions and analysis. And because of this rote tendency, the opportunity to take fans emotionally deeper is missed too often. If I’m feeling all this mental, emotional and physiological stuff as a fan, and I know players feel it too, then why don’t we find a way to unpack that during a game? Why not explore the “deeper why” of why we love live sports more during the actual game? Knowing that most of sports is mental I find it ironic that most live announcers and sport analysts don’t focus more on the mental and psychological side of the game. Instead they focus too much on numbers and stats and continue spewing out a stream of meaningless statical data that lacks any emotional significance. So I wonder why we don’t see more exploration of integration of the mental and emotional analysis in live sports? Like what I’ve seen, experienced and found to be true in live music by exploring the emotions we feel before, during and after a live concert, I believe we need to do the same things in live sports and shake things up a bit and make watching live sports more interesting and emotionally meaningful. 5. I like watching food shows instead of live sports. So to confess, I got hooked on Food Network and Travel Channel shows. Not that that is necessarily a bad thing to watch those shows. I just thought that it was interesting to note that I gravitated to those shows when I couldn’t watch sports. 6. I realized (even more) that I love the story behind the game. I knew going into this experiment that I love backstories of live sports often more than the game itself. But completely removing live sports from the equation gave me the opportunity to better understand what it is I love about the bigger picture and broader contextual backdrop of the games and teams I love to watch and the players who play the games. The live sports industry needs to find a way to blend more stories and how players and fans feel into the game itself and not just mix it in after the fact. Watching ESPN’s 30 for 30 series made me realize that there’s such a void in understanding what a game really means to us in the broader context of our lives, and that it’s only in hindsight that we truly understand the level of social and emotional impact a live game has on us as individuals and our society. Taking a full year off of sports made appreciate this truth even more. So I wondered, is there anyway we can be more aware of this as live sports is unfolding? I know we have sports journalism to do this, but too often even that fails to unpack and go to the emotional level that we need to in order to fully understand how a live sporting event is or isn’t changing our lives. Again, like my annoyance of live sports I shared earlier, I think there’s a great opportunity to tell emotional stories better during live games. I knew that I spent roughly over 658 hours watching sports in 2013 and I thought that I would have the opportunity to use all those hours to achieve much more and see an increase in productivity. This didn’t exactly play out the way I expected it to. Yes, I did use many of those hours to do other things than watch sports such as like write more, workout, read more and watch TedTalks. So was I more productive? Part of me wants to say yes. But part of says no and I feel like I could have done more. I guess that’s just the guilt talking. This experiment was certainly no waste of my time just because I wasn’t a productive as I wanted to be. I do feel like my mind evolved and I have a new level of self-awareness and mindfulness that I didn’t have before. It wasn’t easy but for each game I didn’t watch I tried to take time to write and reflect on why I wanted to watch the game and during that process I had the chance to reflect on all the emotional connections I have to live sports. So I guess I was more emotionally productive. Social media made it basically impossible to not have some kind of live sports touch my eye balls for a brief moment. Scores, big plays and emotional reactions to games flooded my social feeds constantly. I thank my Twitter and Facebook friends for keeping me fully updated with a constant stream of sports information that I didn’t want but nonetheless found its way into my life in 2014. Because of this I’ve become more aware of how much my family and friends watch sports and how these meta-live sports social experiences impact our lives. Honestly, at times I got annoyed and considered hiding posts or de-friending people just to avoid it all. But I didn’t and like this entire experiment, social media made things messy and complex. Social media made the experiment more emotionally intense. I was surprised at how annoyed I got at others posting game updates of games I couldn’t watch. But again, this annoyance and irritation showed me something. It revealed another layer of important questions to the experiment. Why was I having such a strong emotional reaction to social media updates? Was it because of the experiment itself or because of my frustration with our culture’s over-indulgence and obsession with live sports? Was social media just making my own emotional struggles more visible and unavoidable? Were those updates mirrors reflecting back to me my own frustration with my live sports obsessions? I struggled with the truth that I love to connect with people during live sports but I get annoyed on a level when all I see in social feeds in live sports updates. What’s up with this? Boy, did this experiment make me think long and hard about why I feel this way. What exactly is at the heart of this emotional reaction? As my social feeds remind me everyday, live sports isn’t going away anytime soon and honestly, I wouldn’t want it to because of the power that it has to bring us together to strengthen and bond relationships. But we should never think that just because we watch a game together that live sports moment is a direct replacement for other types of meaningful interaction. I sometimes fall into that trap and this experiment showed me I have so much more to understand, explore and work on in this area of my life. 9. I had enough past sports knowledge to fake like I did watch sports. I’m not sure if that’s a good or a bag thing but throughout my experiment I had several “fake sports” conversations and it presented an interesting social sub-experiment. I faked like I was watching sports to see if my past sports knowledge could allow me to not miss out on having important small talk that might lead to deeper relationship with people I know at work and other areas of my life. I’m a fan of using improv and stream of consciousness to engage my creative side and I love a good interpersonal social experiment on the fly. I wanted to test out my skills of making things up as I go based what I already about live sports starts water cooler conversations. In some cases I made up plays that didn’t exist and nobody seemed to notice and they agreed my “fake play” was a great moment in the game. I thought that said a lot about how we interact as humans and the role small talk plays in bridging gaps and breaking the ice. In some situations will go to great lengths, even lie, to maintain status quo and not rock the relational boat. After this happened a few times, I wondered how my times someone has humored or lied to me about what they’ve watched just to make me feel good or not disrupt the flow of conversation and avoid a awkward social moment. Other times I “faked it” for a short time and then told them I was doing an experiment or other times I simply said, no “I didn’t watch the game” and told them why. In each of those situations, it led to a really cool conversation about why we watch live sports and I got to know that person in a different way. Next time, I’ll just tell the truth up front and have more really cool conversations. 10. Watching live sports is and is not, a lot like watching a live concert. This was one of the things I was very curious about. Being a live music fan I was aiming to discover what live music and live sports had in common. For starters, our emotions play a big role in both situations. Each have a similar ebb and flow, up and down nature as a game can swing in our teams favor sending us up into a crescendo of elation and then crashing down to valley of despair and disappointment should things slip away. Likewise, a band’s set list can woo us into a state of utter bliss taking us down memory lane with one powerful combination of melody and rhythm or a live show can dash our expectations if the band doesn’t play our favorite song or is out of sync and the vibe isn’t quite right. One difference I noticed is that I’m more consciously aware of my how I feel emotionally during a concert than during a live sports game but one thing I learned was that as a sports fan I would be missing out if I disregarded how much a live sports game really moves me. What surprised me was that I noticed that live sports has actually made me feel more sad and depressed; I’m thinking of what it felt like to watch the Cubs lose this year in the NLCS and what it feels like to watch the Bears implode on a Sunday afternoon. Maybe it’s because I want the joyful bond and glorious nostalgic feeling of watching a game with my family and dad to live on and when the game ends I’m tossed into a saddening funk. And this emotional funk is even worse if my team loses. That’s why I don’t think how the low we feel once a game is over is only just about the final score. We’re sad partly because that live sports moment is over and we want it to live on. We want to continue to escape together (or alone) but reality is back. And we must face it. Thinking back to my worst concert experience I can’t say I ever felt the same as I did after watching a bad game. I just feel different emotion. Not quite sure why? But I just know that I feel different. Do I feel more connected with my fellow concert fans during a show then I do at a live game? Is the communal goal and emotional rewards different during a live game versus a live show? Like everything else in this experiment I’ve ended up with more questions than answers. What I do know is that with both live sports and live music the opportunity to feel emotions is always there. I’ve been ambushed by emotions in both situations but for different reasons and it different ways and I can still choose to feel the emotions or turn away and stuff them back down. I can tell you that my best live sports moments and live concert moments have come when I don’t stuff but I feel every last bit of emotion during and after the experience. So would I ever not watch sports for a year again? I don’t think I’d ever go a full year again, but I might go for shorter periods of time if I need to unplug and reflect. For now, I’ve learned what I needed to learn and I’m aware of the behaviors I need to change and what I need to reflect more on. I also might post updates as new ideas and insights bubble up so stay tuned. Without a doubt, this experiment was tons of fun and extremely valuable and I can tell friend and my grandkids someday that I did it. Would I ever pick something to not do for a year again? Perhaps. It’s been such a great learning experience that I’ve begun to think about what else I could do and what other areas of my life I could experiment with. Would I recommend you do it? Absolutely! If you can stick it out and keep an open mind, I’m sure you won’t regret the adventure. Good luck and game on.